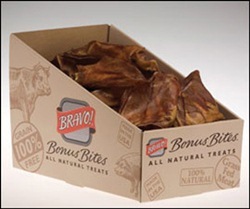 Bravo!, a Connecticut company that makes raw diet pet food and all-natural treats is recalling certain boxes of Bravo! Pig Ears Chews because they may be contaminated with Salmonella. The recall is the result of a routine sampling program by the Washington State Department of Agriculture which found that the finished products contained the bacteria. The company said it has not received any reports of illness in either people or animals associated with the pet chews. Bravo! 50 ct bulk Oven roasted Pig Ears Product Code: 75-121 Lot # 12-06-10. The Bravo! Pig Ears were shipped to retailers on the East and West coasts between Jan. 1 and Feb. 28, 2011. Bravo! has no product left in inventory from this batch of pig ears. Consumers who purchased the recalled pig ears are urged to return the product to the place of purchase for a full refund. Consumers with questions about the recall should visit www.bravorawdiet.com or call toll free 1-866-922-9222 9 a.m. to 5 p.m. Monday to Friday..
"Salmonella can affect animals and there is risk to humans from handling contaminated pet products. "Healthy people infected with Salmonella should monitor themselves for some or all of the following symptoms: nausea, vomiting, diarrhea or bloody diarrhea, abdominal cramping and fever. "Pets with Salmonella infections may be lethargic and have diarrhea or bloody diarrhea, fever, and vomiting. Some pets will have only decreased appetite, fever and abdominal pain. If your pet has consumed the recalled product and has these symptoms, please contact your veterinarian."